Harald Deilmann was a German architect born in Gladbeck, Westphalia, known for his work on public spaces, such as opera houses and museums, throughout Germany and worldwide. 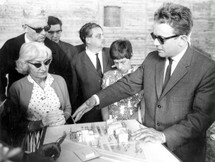 He was a member of the Academy of Arts in Berlin, as well as the Deutsche Akademie für Städtebau und Landesplanung (German Academy for Urban and Regional Planning) in Hanover, Germany. He was an associate of Heinrich Bartmann (1951-1953) and joined the Architektenteam Münster (Harald Deilmann, Max von Hausen, Ortwin Rave (de), Werner Ruhnau (de) in the competition for the theater Münster in 1953. 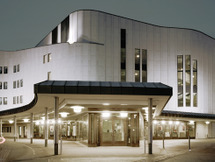 He left the team before the opening of the theater Münster to start his own office in 1956. He took part in the development of his home town Münster in the time of the german Wirtschaftswunder 1950-1975. As a protagonist of postwar modernism, he taught architecture at the Technical University Stuttgart and Dortmund. Deilmann officially retired in 1985 but continued to do freelance work until his death in Münster.